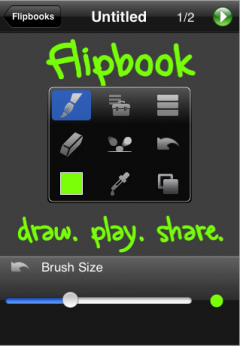 Two iPhone apps with similar names and similar functionality have appeared to offer those with artistic ability a chance to create their own flip book type animations on their iPhone. 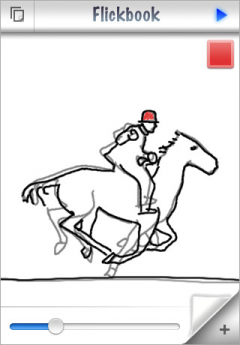 FlipBook [$9.99, App Store] by Josh Anon provides what appears to be a relatively sophisticated set of tools to create animations right on your iPhone. FlipBook has everything you need to get started animating, from an eraser to onion skinning to layered drawing. Load images from your photo library, including images taken with your iPhone's camera, and draw on top of them. If you make a mistake, just touch Undo or double-tap for Redo. Touch Play when you're ready to see how your movie looks. Unique to Flipbook is the ability to export movies onto the Flipbook.tv. Those movies can later be downloaded and reuploaded to Youtube. Forum member, TimothyB, has posted a couple of his early creations: chase scene, Fox. FlipBook provides multiple tour videos to walk you through the application. - Faint reminder of your previous frame making it easier to draw the next. A video demo is offered at the developer's site: Flickbookapp.com. There is no way to export Flickbook's videos at this time, but the developer is said to be working on it for a later update.